So there was a problem. We were missing something critical. Something critical that a road trip cannot function without. We had an ipod, but we needed a cable that that would allow us to play songs from the ipod in the car. So we made a stop and got the cable before starting the day. I really liked the crashing spaceship design at Fry's Electronics. 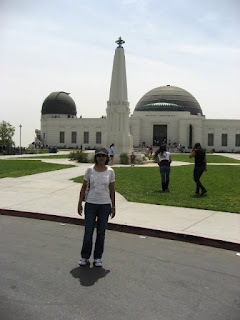 Now that we were all set, we headed towards the Griffith Observatory. Opened in 1935, I read that the observatory logged more than 13,000 visitors in the first five days! As we drove towards Mount Hollywood where the observatory is located, we saw many many cars. Once we got there, we couldn't find any parking. Cars were lined along the road as far as you could see. So we drove on and on until we found the last car in the line and we parked there. It was going to be a long climb up to the observatory, but luckily we had comfortable shoes on. It's a beautiful place for a hike, and we stopped several times to take pictures of t he view. We also stopped to catch our breath, and the benches were a welcome sight! Finally, we caught a glimpse of our destination. Even though it was almost noon by the time we got there, the Sun felt pleasant on the skin. I can't say it enough -- I LOVED LA weather! The observatory is named after Griffith Jenkins Griffith, an industrialist who donated more than 3000 acres to the City of Los Angeles in 1896, which is now Griffith Park. In his will, Griffith also donated funds to build an observatory, exhibit hall, and planetarium on the donated land. The first exhibit we saw was Foucault pendulum, which was designed to demonstrate the rotation of the Earth. The set-up consisted of a pendulum free to oscillate, and a series of pegs in its oscillation path. If you stood there long enough, you could actually watch the pendulum knock down peg after peg, proving that it was the earth that was rotating under the pendulum. It was possibly the most popular spot as people kept coming back to see how many pegs the pendulum had knocked down. More than the observatory, it's the scenic views around the area that make it a must-see. Especially recommended for hiking! After this, we were off to a friend's place. We had studied together in university, and he was also in the same hostel as me. I had not seen him in years, though Viv had during his last trip. There were the hugs and "OMG, you're looking younger and fitter!" exclamations (that would be me. The exclaimee I mean, not the exclaimer. So yeay! ), were off to have lunch at this Argentinian place that served empanadas, a kind of stuffed savoury pastry, ideal for a light lunch. After lunch, we headed back to his place for chai (he had always been one chai addict and nothing had changed) and reminiscing (in other words, remembering and laughing at the antics of those who had been unfortunate enough to attend university with us). Next up was the drive to Santa Monica beach, where Viv spotted 'The Todd' from Scrubs jogging with his dog. We couldn't get a picture with him though. I spotted this when we were walking along the beach. It was a little alarming. Can you see the erosion? We then went for a walk around Third Street Promenade, a beautiful pedestrian street, lined with shops and eating places. I couldn't afford anything in the shops, but the walk was really nice. We finally entered a shop where we could afford something -- gelato ice-cream! Happily eating our ice-creams, the three of us headed back and just about managed to catch sunset. Parting shot of the day -- I really liked the tree behind us. Couldn't agree more when Viv said it was kind of like the Whomping Willow in Harry Potter. And why not, obviously you both HAD to be 10 degrees hotter than the lot :D Haina?